Melanie Pressley of Lakeport, Calif., found hundreds of dead fish floating in Clear Lake near her home on Sunday, July 31, 2016. 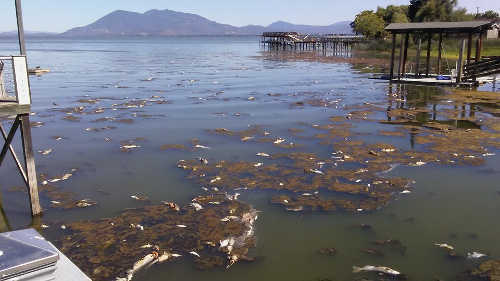 LAKEPORT, Calif. – Warm water, lack of oxygen and a heavy biomass load in Clear Lake are among the factors that local and state officials believe are behind a fish die-off in the Lakeport area that occurred over the weekend. Melanie Pressley, who lives on the lake in the north Lakeport area, said the lake looked good on Saturday night, but when she got up Sunday, she saw hundreds of dead fish on the water. Pressley said that in the 10 years she has lived at her current residence in Lakeport, she's never seen such a die-off, although they're not uncommon on the lake. “I've heard of it, I've never seen it in a big mass like this,” she said. Carolyn Ruttan of Lake County Water Resources said she got a report of the die-off on Sunday. She confirmed Pressley's statement that all types of fish were involved. The area where the die-off occurred starts at Berger Bay, which Ruttan said is the midpoint between north and south Lakeport on the eastern side of Clear Lake, and moves south along the southern part of the lake's upper arm.